With homelessness in the UK at an all-time high, will local authorities be willing to show considerable leniency towards squatting or even sanction it? It’s a controversial thought but with many local councils now reaching a financial breaking point, it’s certainly one way of balancing the need for housing against councils’ costly obligation to provide homeless people with emergency accommodation. Is there a case for encouraging squatting? A report featured in The Guardian newspaper states, according to Shelter, the housing and homeless charity, there are more than 300,000 homeless people living in Britain today. Around 4,700 of them are sleeping rough on the streets, and with 449 deaths of homeless people recorded in the last 12 months alone, it appears drastic action will become a necessary option in order to tackle this socially uncomfortable, modern crisis. 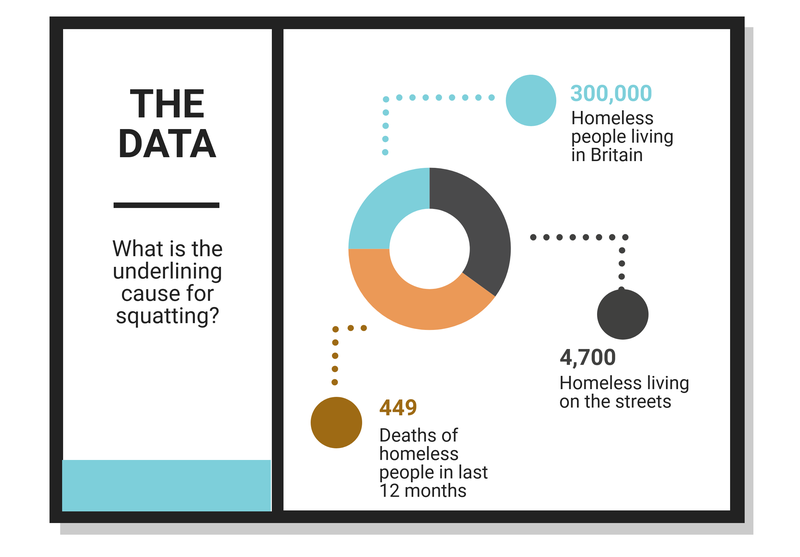 So that leaves the question – should squatting then be encouraged to alleviate homelessness? Are Empty Homes Fueling Speculation Over Squatting? We British pride ourselves on our tolerance and fairness. We reach out to all sectors of society, offering acceptance, empowerment and freedom, and yet we seem to conveniently ignore a real and serious injustice being played out every day on our streets. For example, there are more than 11,000 homes in the UK, which have been empty for more than 10 years. That’s a scandal but further research by the Liberal Democrats has found that more than 216,000 homes across the country have been empty for 6 months or more. ● Is shortage of homes obvious reason for squatting? For a residential property to be unoccupied for such a lengthy period of time suggests many of them may be second homes or holiday homes. 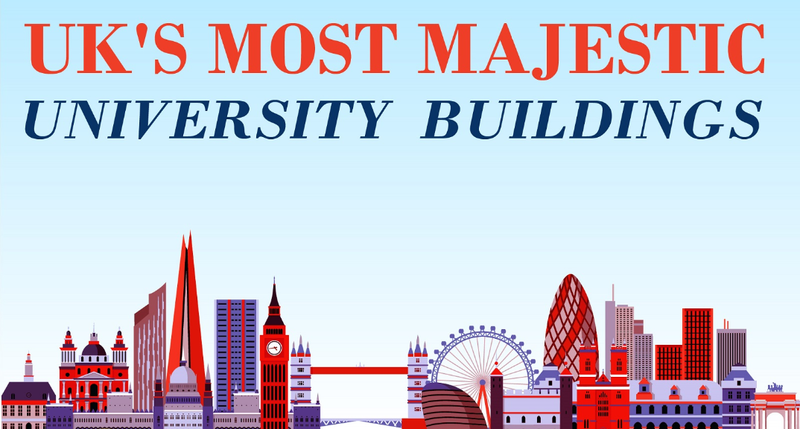 Some people would say that the practice of buying property for occasional use, is one of the obvious causes, which has led to the UK’s chronic property shortage. That said, local authorities must shoulder some of the blame for not building enough affordable accommodation. Why are people living in squats, risking fines and imprisonment? Well, let’s look at this scientifically. Substantiated numbers are facts that can be documented. For example the number of recorded homeless people is a fact that has been documented. The number of people squatting in the UK is also a fact, and although the exact numbers cannot be verified, it is estimated to be around 25,000. 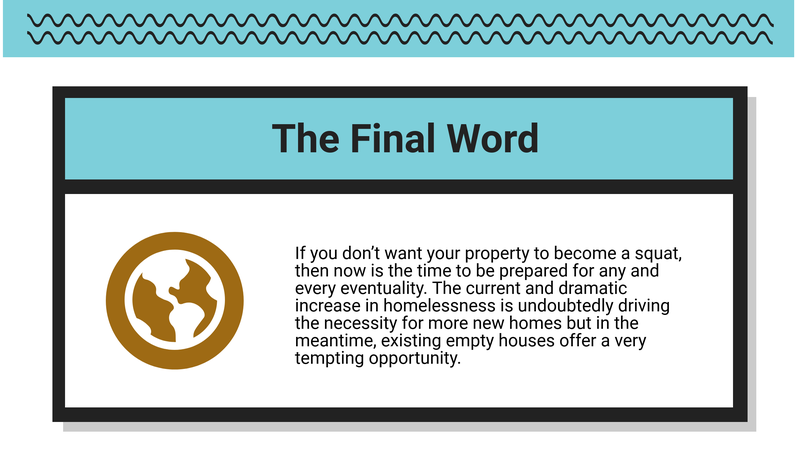 The number of long-term empty properties in the UK is a fact, and so is the number of short-term empty properties. Homelessness is still rising in the UK and the number of rough sleepers has risen to 15% above the number recorded for 2016. Sir Isaac Newton’s 3rd law states, “For every action, there is an equal and opposite reaction.” That means, when one body exerts a force on a second body, the second body simultaneously exerts a force equal in magnitude and opposite in direction on the first body. So, if we are to use this law as an analogy then an increase in homelessness, contrasted by the current number of vacant properties, will inevitably lead to an increase in squatting. That’s about as scientific as it gets but on the face of it, the numbers do make a solid case for almost justifying an increase in squatting. Squatters Have Rights… Don’t They? 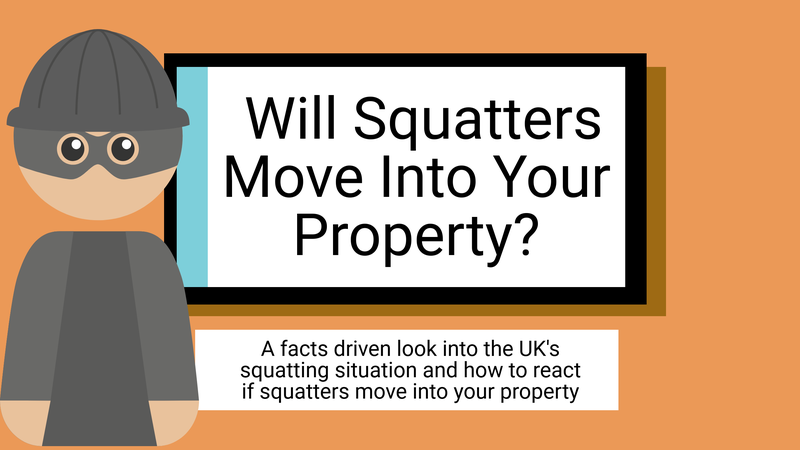 Whilst numbers, facts and stats have their place in determining possible outcomes of actions and reactions, it’s not difficult to see why squatting could be on the increase. When faced with life on the streets, the prospect of a roof over your head, even if it does belong to someone else, is a worthwhile consideration. So what does the law concerning squatting actually state? ● When is squatting NOT a crime? Well first off, it is not a crime to squat in a non-residential property. That means it’s perfectly okay for someone to move into a commercial property and make it their home as long as the property is not classified as a domestic house or home. Factories, warehouses, garages and hen houses are all fine as long as the squatter doesn’t damage the property, fixtures or fittings. 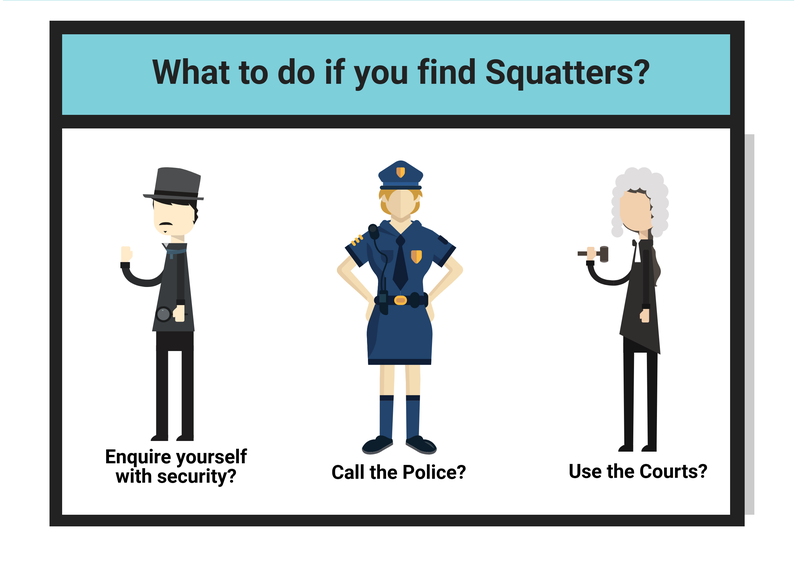 ● Could you be inviting squatters into your property? When it comes to domestic properties however, the law can still temporarily side with the squatter with just a few conditions. For example, if a person moves into a rented property and then fails to pay any rent, they are technically squatting but that’s not breaking any laws because the landlord invited the person in and gave them a key. If however, someone enters into a vacant domestic property and takes up residence, they are breaking the law. Now, if the property owner doesn’t do anything about it, because they don’t know their property has been broken into, and the squatter remains in residence for more than 28 days then the owner has to make a claim for possession of the property with the courts. This allows the squatter even more time to enjoy the comforts of your cherished ‘second home’. In effect, a squatter could remain in your home for 2-3 months after illegally entering the building and it’s going to cost you a tidy sum to regain the property. If that sounds a little scary then consider the rights of a squatter who has lived in someone else’s property for 10 years or more. They are then legally permitted to claim the property as their own. If the property is not registered with HM land registry then they have to wait 12 years before they can apply for ownership. This has actually happened many times. However, the case of ‘Adverse Possession’ is one that all property owners should be aware of, even if they think it no longer applies. Leaving a property empty for any length of time is simply inviting problems and not just from damp, dry rot and peeling paintwork. An empty rundown house can eventually attract the attention of potential squatters. This became the focus of a well documented case for pensioner, Colin Curtis. 80 year old Mr Curtis had vacated his £400,000 inherited property in Newbury, and moved into a flat some miles away. He continued to pay council tax on the empty house but didn’t use or visit the property. If he had, he would have found that it was being quietly renovated by a builder who later moved in and claimed it as his own. To add insult to injury, not only did the builder win his claim, Colin feared he would have to pay all the legal costs, including those of the builder, totaling some £37,000. The law has since changed in favor of property owners and subsequently squatting, or ‘Adverse Possession’ of any residential property is now definitely illegal but there are still a few loopholes, which can be exploited by anyone intent on living in a property rent-free. These loopholes are associated with numerous complications in enforcing the law on squatting and in determining the difference between a squatter and a tenant. Are You Worried About Squatters Taking Over Your Property? Squatters are homeless people looking for somewhere to live but sentiment aside, your home, second home or holiday home is still your property and therefore the onus is on you to ensure squatters don’t move in on your territory. However, with councils coming under increasing pressure to house the homeless and the obvious injustice due to so many empty properties around the UK, a ‘use it or lose it’ policy may not be too far off the horizon. Property owners need to be aware of the rising unrest, against what is seen as ‘those selfish multiple home owners’, and take action. ● Consider letting your empty property – Prevention is always going to be the best option so first, ensure your property is absolutely secure. A property that has been unoccupied for a few months could possibly be a prime target so consider renting your property on short lets or find a ‘property guardian’. Consider using a letting agency to manage short lets or an Air B’n’B service. ● Consider using the services of a property guardian – Property guardians are people who are willing to live in your property for a low rent or rent free in exchange for maintaining the property. There are now agencies who specialise in providing property guardians. Alternatively, you could simply ask a neighbor to keep an eye on the place in exchange for a small fee but having someone actually living in the house is the better option. 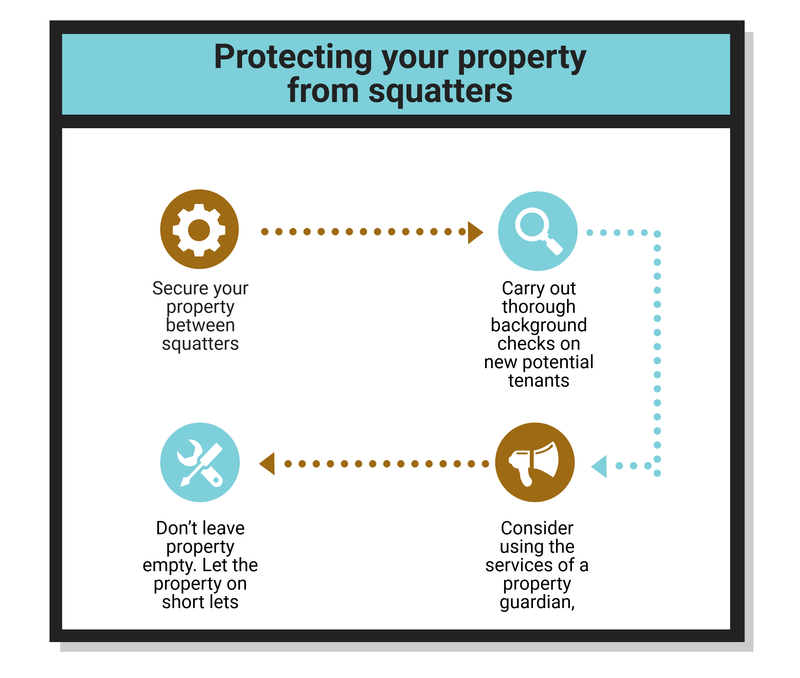 If you find squatters have moved into your property then they are trespassing so you have the option to remove them yourself, using reasonable force. However, this form of action is not recommended. Instead you can employ the services of a security firm to persuade the squatters to leave. If you decide to use this method, there is always is the possibility that excessive force is used and therefore a criminal case can be brought against you. The police may be reluctant to get involved unless criminal damage has occurred or violence has been used or threatened by the squatters. The safer option according to the government is to exercise your legal rights by applying for an Interim Possession Order (IPO). You can apply to the courts for an IPO if it has been 28 days or less since you found out that your property was taken over by squatters. You will receive the necessary order within a few days and then the squatters must leave the property within 24 hours of the notice being served or enforcement action will be taken against them. If the time frame exceeds 28 days then you can make a claim for possession. Fees apply to both options. Secure your property between tenancies. Carry out thorough background checks on new potential tenants. Don’t leave property empty. Let the property on short lets. Consider using the services of a property guardian, especially for holiday homes or if you intend to be away for long periods. Ask the squatters to leave the property within 24 hours. Since September 1st, 2012, squatting in a residential property has been a criminal offence, punishable by a maximum prison term of up to six months, and / or a maximum fine of £5,000. It does appear however, the police are most reluctant to exercise these powers and therefore property owners often have to rely on their civil law options. Click here for more information. How can Housebuyers4u Help if Squatters have Infiltrated One of your Homes? Sadly squatters are an issue and if the homelessness figures continue to increase there is no doubt the amount of squatters will also begin to rise – here’s how Housebuyers4u can help. We are genuine cash home buyers who will buy your house in any condition regardless of what situation the seller is in. So whether you’re in mortgage arrears, want to sell up because of personal reasons like divorce or have a ‘problem property’ we can help. So are you interested in a quick house sale? Get in touch with us today for your free no obligation cash offer!